NZ Herald, 10th February, 2015. The letter at right appeared in the NZ Herald on 10th February and that day I emailed the following letter in response. To the best of my knowledge my letter was not published, so here it is. 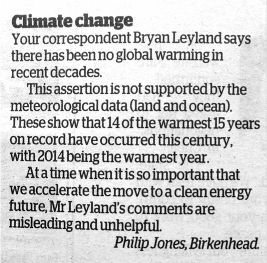 Your correspondent Philip Jones claims Bryan Leyland’s assertion of ‘no warming’ is incorrect, saying the temperature data do not support it. Hockey sticks beware – dendro rulz! A new study shows modern temperatures are not unprecedented and disproves an important part of Mann’s “hockey stick” paper of 1999. 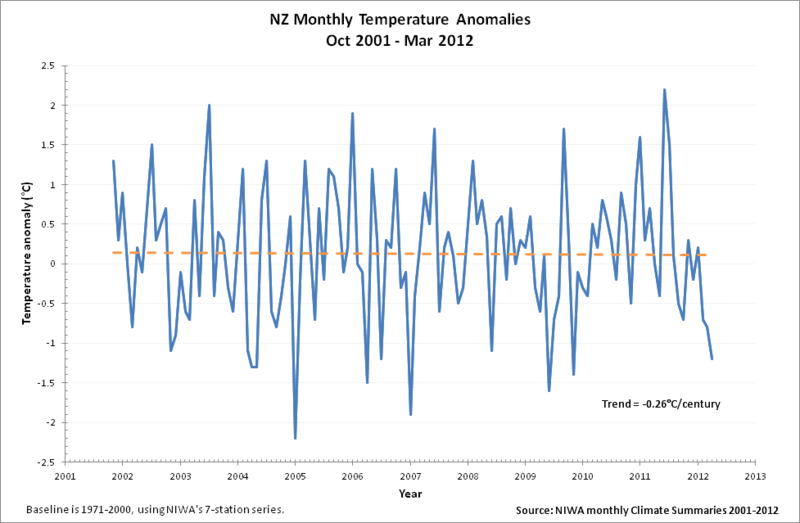 NZ monthly temperature anomalies 2001-2012 from NIWA’s monthly press releases. Although the trend is as near to zero as “damn it” is to swearing, it is, as a matter of fact, cooling. Anyway, for at least 10 years and 5 months, New Zealand has officially experienced no warming — unlike the great globe itself, which was predicted by highly skilled computer models to warm about 0.2°C over the same period, and so no doubt it did warm. Oh, no it didn’t. I thought I’d share the local New Zealand temperatures over the last decade. I downloaded all NIWA’s Climate Updates from their website (the first one I could find was Oct 2001) and plotted the temperature anomalies that were published for each month. Of course, what with Catastrophic Anthropogenic Global Warming and all, I expected to see temperatures rising (accelerating, even) in a wild, out-of-control fashion, as the water vapour feedbacks kicked in, tripling the initial warming that came from the gigatons of poisonous carbon dioxide pollution that we’ve spewed (spewed, I tell you) into the atmosphere over the past decade. Thanks to those who advised me of this amazing email from the Climategate 2 collection, either through comments here or private email. 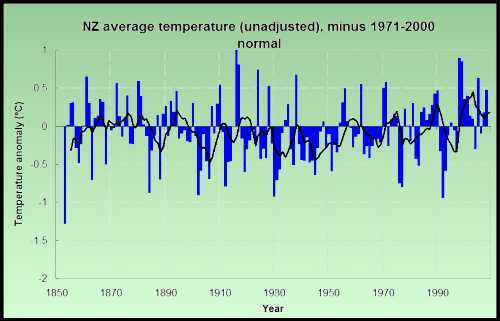 It concerns the pre-1930 cooling of the New Zealand temperature record, and makes food for thought, especially for those supporting NIWA, Salinger and the increasingly shaky AGW story. Although it’s more of a novel, and a bad one at that, with gaping holes in the plot and evidence so carelessly thrown together it fools nobody. Now, as many of us feared was the case, comes evidence that the NZ temperature record has been applied to far more places than where it was observed. We now know it was stretched over far-flung places it was never intended to go. This is the worst result possible. just a quick Q before I go to bed! with CRUTEM2v Jan-Mar smoothed temperatures. with a few more years on the end. 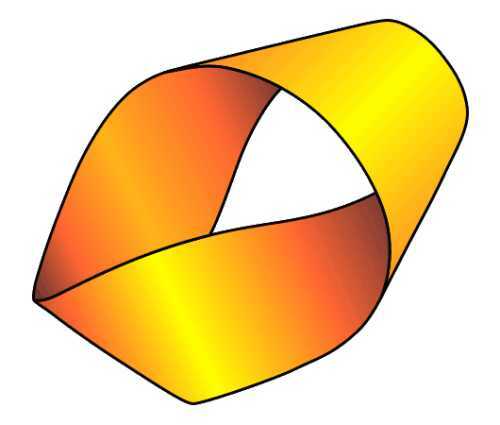 (by > 0.5 degC for a 25-year low-pass mean) in CRUTEM3v than CRUTEM2v. mean, now they’re at -0.5 degC. data? Or just some random artefact of minor changes somewhere? Here in New Zealand, the NZ Climate Science Coalition has battled for several years to understand the national temperature record and get the data released that lies behind it. Now we battle to correct it. Because NIWA, in “reconstructing” the record, manages miraculously to lower past temperatures and increase recent ones to create a spurious warming that overstates the actual national warming over the last hundred years by 168%! We’ve told NIWA about it and we’ve sent them our report that proves it, but they refuse to acknowledge our finding, much less explain themselves. It is a national disgrace which our newspapers, magazines, radio stations and television channels strangely refuse to investigate. 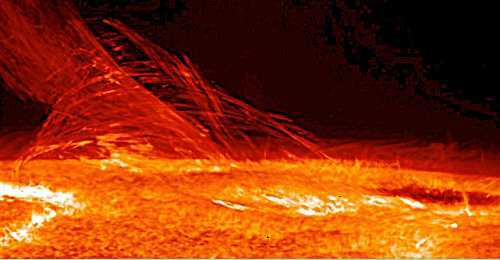 The warming is truly man-made, for it hasn’t happened in the real world, it has been created only by the adjustments. Well, yes, because “blame” for this interruption in warming has been placed on sulphates emitted by China’s power stations zealously burning coal. Hasn’t it? Has this hypothesis been tested? No. Can it be tested? Yes. Most of the aerosols are in the northern hemisphere, and there’s little mixing of air between the hemispheres. Reason tells us that the northern hemisphere should be cooling and the southern hemisphere should be warming. Panorama taken in 1902 of Albert Park towards the south. It’s obvious here that the trees are very young—most are little more than shrubs. For perspective, see the figures standing by the fountain and on the path to the very left. Click for larger version. The official New Zealand Temperature Record is made up of historical temperature readings (raw data) and NIWA’s adjustments. Both of those components are unreliable. The 169-page Report on the Review of NIWA’s “Seven-Station” Temperature Series, or the Review Report (RR), published by NIWA in December 2010 devotes very little space to that bane of climatologists — the urban heat island (UHI) effect. It has been long recognised that air temperature readings taken in towns and cities are affected by the heat absorption of concrete and tarseal surfaces; by exhausts of vehicles, aeroplanes and air-conditioners; and by structures which deflect wind and confine humidity. Because a “heat island” is not representative of the wider region or country, most climatologists try to give them a wide berth. Wikipedia says that “the temperature difference between urban areas and the surrounding suburban or rural areas can be as much as 10°F”. A similar enemy of the climate archivist is “shelter” — trees or structures which interfere with the thermometer’s normal exposure to wind or sun, and thereby cause distortions. There are many temperatures in this place. Which one is the ‘right’ temperature? Official temperature records have been maintained in New Zealand since shortly after European settlement began in 1840. Throughout the ensuing 150 years, mean temperature levels appeared to remain stable. But NIWA (the responsible Government agency) has recently questioned the historical record, suggesting a long-term warming trend may have been hidden in the data. 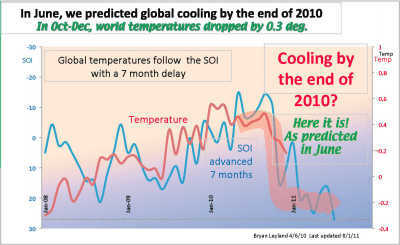 Bryan Leyland’s latest graph (January 2011) showing the implied SOI forecast (thick pink line) of global temperatures for late 2010. Click for larger version. 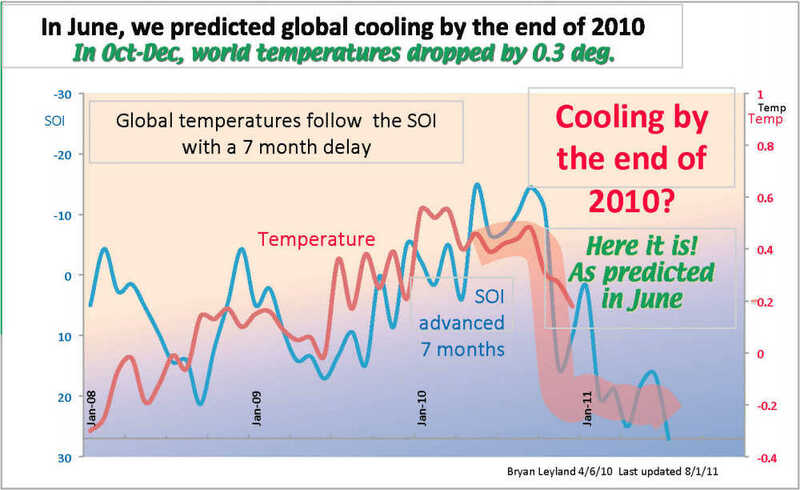 On December 1 last year, we wrote about Bryan Leyland’s prediction of significant cooling before the end of the year coming true. You can see from the chart exactly what happened. Not only that, it would appear that the temperature has not finished going down yet. The CCG has responded to this happy news by issuing a press release. Does this new method perform better than the IPCC? The Southern Oscillation Index (SOI), according to the Australian Bureau of Meteorology, is calculated from the monthly or seasonal fluctuations in the air pressure difference between Tahiti and Darwin. The paper, by John McClean, Chris DeFreitas and Bob Carter, shows that what the SOI does now, the temperature will do in between five and eight months’ time. NIWA’s graph of the (unofficial) NZ annual temperature series. The highlight shows a remarkably mild rise for the last 60 years. How long must we wait for global warming to reach New Zealand? Why do they continue to display it? It lacks any kind of scientific justification or integrity. The main authority describing its methodology has never been cited, never been copied, never been peer reviewed. None of the seven weather stations (only seven for the whole country, out of hundreds?) showed significant warming in their raw readings. But six have had a “temperature rise” imposed by adjustments, 90% of which served to create warming. Have NIWA no shame? They should have withdrawn this spurious piece of scientific chicanery months ago. Instead, it remains there to lie to our children. We’re still waiting for the new version, reviewed by the Australian Bureau of Meteorology, promised by NIWA last March. Will we see it before Christmas 2010? When we finally do see it, will it still show nearly a degree of warming over the 20th Century? If it does, how will they justify that? If it doesn’t, how will they face their public, for what will happen to their claims of anthropogenic global warming? 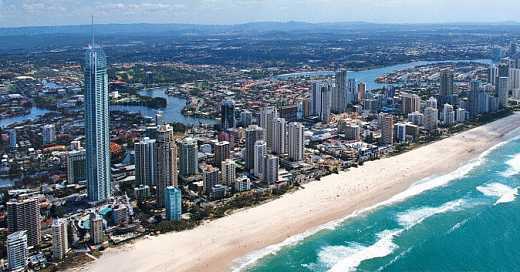 It’s easy to accept that the little band of sand beside this mighty metropolis occasionally registers slightly higher temperatures than caused solely by meteorological conditions. There’s some excitement around blogdom with the Australian Bureau of Meteorology (BOM) apparently questioning the UHI adjustments it’s made to the temperature record. If you thought our cities are getting warmer, you’re right. Temperature adjustments science or art? 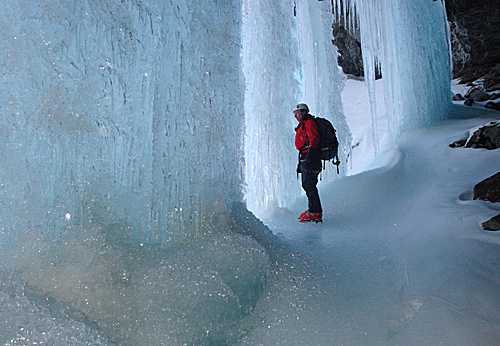 A beautiful, solidly iced-up waterfall shows that temperature extremes can be inherently artistic. 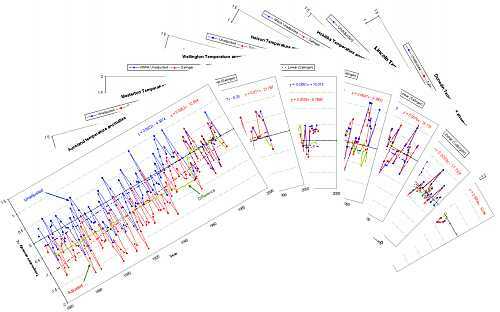 The investigations of the NZCSC into the national temperature record make it obvious that temperature adjustments can also be artistic — even when their creators try to present them as being solidly scientific. 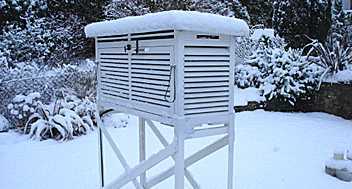 In February 2010, NIWA published a showcase paper titled Creating a Composite Temperature Record for Hokitika, offering details of adjustments it made to the NZ Climate Database for the Hokitika Airport weather station — one of the “Seven-station Series” (7SS) which makes up the official New Zealand temperature record. The NZ MetService measurements for Hokitika cover the 20th century and display no significant linear trend up or down. The temperature recorded here in 1900 was 11.8°C, while 2008 was 11.93°C, and the 30-year average from 1971–2000 was 11.74°C. The NIWA-adjusted version, on the other hand, shows a linear warming trend of 1.3°C, largely brought about by downward adjustments in the Hokitika temperatures in the first half of the century. The justification for those adjustments has been cited repeatedly as being an Appendix to a university thesis submitted in 1981 (see “The Salinger Thesis”). Here are the two temperature records together: the MetService raw data showing a little warming trend, overlaid with the NIWA-adjusted official record, “proving” strong warming 50% higher than the rest of the world. The Hokitika details were made public as a worked example of the adjustments that NIWA has made to all seven weather stations in the 7SS, in consequence of the Salinger thesis. Accordingly, the credibility of the entire project stands or falls on the strength of reasoning advanced for the Hokitika alterations. When we published our paper Are we feeling warmer yet? last November, criticising the Seven-station Series (SS), NIWA quickly produced what they call the “Eleven-station Series” (ES) to counter it. 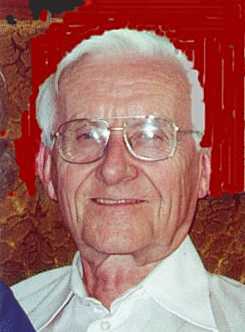 They went to the trouble of asking Dr Jim Salinger, recently dismissed and author of the original national temperature series, to help them create it, which makes us realise that nobody at NIWA understands how he produced the original figures. According to the NZ Herald, Jim specially selected the stations for the ES. Some people would be impressed by that news, but others find their antennae stiffening at the idea of “specially selecting” data for any reason. It might be justified, but then again, it might not. The situation calls for careful study. So what has happened? We can say a few things about it. I’ve just come across this video of Godfrey Bloom, Member of the European Parliament for Yorkshire. He was speaking in Strasbourg during the debate on the outcome of the Copenhagen summit on climate change when he gave this furious tirade against the belief in global warming. The surprise for us was that, near the end, announcing that the New Zealand temperature database was “fraudulent”, he suddenly brandishes a copy of our report, Are we feeling warmer yet? It’s a dramatic moment! So how about that, then? The Wellington offices of NIWA. Yes, the anonymous building in front dominates the image. No, I don’t know whether it belongs to NIWA. NIWA blundered in not keeping track of some important records that justify the country’s warming since the 19th Century, even if it inherited the problem from its predecessor in the Met Service, or the early behaviour of Jim Salinger, who did the work. It blundered again when, instead of being honest, it attacked the CCG and the NZCSC when we asked to know the Schedule of Adjustments. Now NIWA has admitted in writing that it lost the original data. This settles our original question for the moment and sets them free to go about repairing the situation. Their general counsel, Tim Mahood, made the admission a few days ago, and here’s the letter to prove it. The NZ Climate Science Coalition had asked NIWA under the Official Information Act last December for the details of the adjustments. This is the original request. Finally, here’s the hard-hitting letter the Coalition sent back to Mr Mahood, setting out the defects in his official OIA response the day before. Have a look at it — it’s dynamite. Now we’re waiting for them to finish re-creating the adjustments to the NZ temperature record and to post them on their web site. They told us today it should happen this month. We’re on tenterhooks and can’t wait to have a look at it. A month ago, when Hot Topic was berating us as unscientific and demolishing our case against NIWA, how many people thought our request was unjustified? How many thought NIWA could do no wrong? How many will apologise to us? Yet who has proved truly scientific? Who has helped to actually improve New Zealand’s temperature record? For that will be the long-term result of our efforts. What a wonderful thing! Having (no doubt painfully) admitted to losing Salinger’s working documents, NIWA is now free to pick up what old records it has and work on them afresh. Without the confession the old records must have languished untouched, their taudry reputation defended less and less vigorously by an organisation tarnished by its neglect of verity. 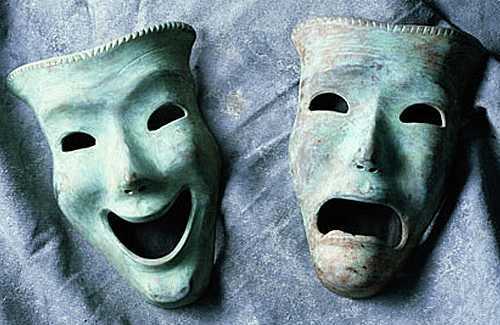 A new spirit of honesty will invigorate the place, for truth sets everybody free. 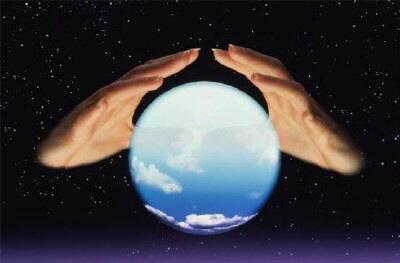 The result must be a more accurate dataset and more confident predictions for the future. I wonder what Hot Topic makes of that? NIWA have published misleading material on their web site and seem to have advised the Minister for Climate Change Issues to give evasive answers to questions in the Parliament. For those unfamiliar with the story: NIWA keeps raw data for the national NZ temperature record and makes it available on their web site. The Climate Conversation Group and the NZ Climate Science Coalition conducted a joint study of the temperature record, researched by a science team and published on 25 November under the title Are we feeling warmer yet?. That study demonstrated that the official graph does not represent the raw temperature data. NIWA told us that adjustments have been applied so we’ve asked for the details. So far they obfuscate. We don’t know why they refuse to disclose what the weather has been. 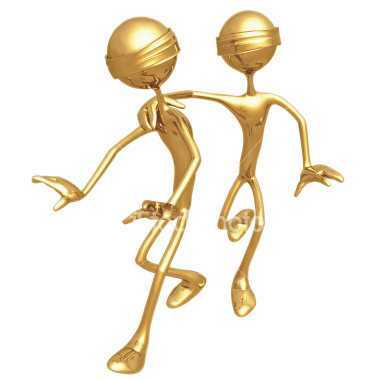 We conclude that NIWA’s response to our enquiries has been defensive, obstructive and oddly disparaging. The Hon Rodney Hide became concerned about deteriorating standards in public science and asked in the Parliament whether the Hon Dr Nick Smith would require NIWA to release the full data for the official NZ temperature record. On the last possible day for answering, Nick finally replied: “You must ask Wayne Mapp; he’s the responsible minister (for Research, Science and Technology, the portfolio that covers NIWA).” We won’t get any Parliamentary questions answered now until well into the New Year, so Nick Smith has caused a considerable delay in getting this information to the public. Gratuitously, he added: “I would note however that the NZCSC have had this information since 2003.” He hoped that little factoid would hurt the Coalition’s reputation, but it won’t, although it might hurt his own — because the Coalition didn’t exist until 2006. NIWA say that the Coalition have had all the information needed to reproduce the official graph since 19 July, 2006, when, they say, “NIWA advised NZ Climate Science Coalition member Dr Vincent Gray” of the need for adjustments and gave him a couple of examples. Dr Gray has located an email of that date and we can now reveal that it was from Dr Jim Salinger, not NIWA, it was not addressed to the Coalition and did not mention the Coalition. It was sent just a few weeks after the Coalition was created, before they ever discussed the national temperature record. Dr Gray tells us that and other emails before and since were not official communications on either side — they were letters between two scientists who had known each other for years. 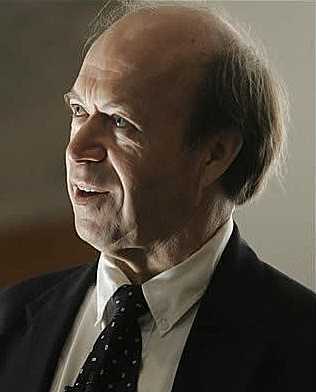 Steve O’connor is a senior geologist who has studied paleoclimate for 40 years. He lives in the circulation area of the Taranaki Daily News, which today published some astonishing comments from one Trotter. I am, unfortunately, unable yet to confirm the Taranaki Daily News item or give a link to it, but I am re-publishing Steve’s letter anyway, because it is the best summary I have read of the central anxieties arising from the global warming scam. It is sobering to reflect that, a mere 65 years after World War II, which killed so many of our finest young men as they defended the freedom we still live in against the oppression from without of the advancing fascist barbarians, we are about to subjugate ourselves from within. For the remaining vestiges of that freedom are about to be crumpled in the unelected fists of the most devoted, socialist, totalitarian, “environmentalist” bureaucrats the world has ever produced, justified solely on the grounds of non-existent evidence of man-made climate control.